Meeting camel spiders and other exotic wildlife along the way, the 25-year-old used tips from the TV survival instructor, to look out for snakes and scorpions and to keep hydrated – with the help of two guides and four actual camels. 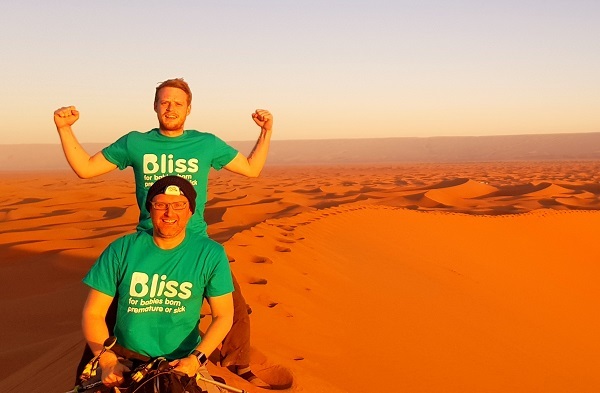 James, who recently handed the cheque over to Bliss, which supported his now two-year-old brother Noah, said: “This is a massive joy for me. I’ve done nothing on this scale or magnitude and can’t believe how many people from Bovis Homes and elsewhere have donated. “I remembered Bear Grylls’ advice after watching episodes of his TV show in preparation, which included basic survival tips and how to identify dangerous creepy crawlies. “My friends and family are so proud of me – including Noah. There was a six-day period when we couldn’t get in touch, so they’re just relieved we made it. “I’ll never forget lying back outside my tent and looking up at the night sky – it’s even more vast and bright than I imagined. “One camel carried all our water and at one point our guides found two wells in the middle of the dessert. We thought it was a mirage. There is nothing more amazing than walking into nothing but open space, sand and cactuses. James, who attended Torquay Boys Grammar, flew out to Marrakech with his uncle, Paul, and the pair took a 4x4 into the Moroccan Sahara to meet their guides, before walking through the Atlas Mountains. Surviving on water, fruit, pasta, potato, bread and tagine, they walked for up to seven hours a day in high heat – suffering only minor sunburn. Highlights of the expedition included climbing a large sand dune to watch the sun rise and celebrating the end of the trek at a base camp with other expeditioners, music and food. 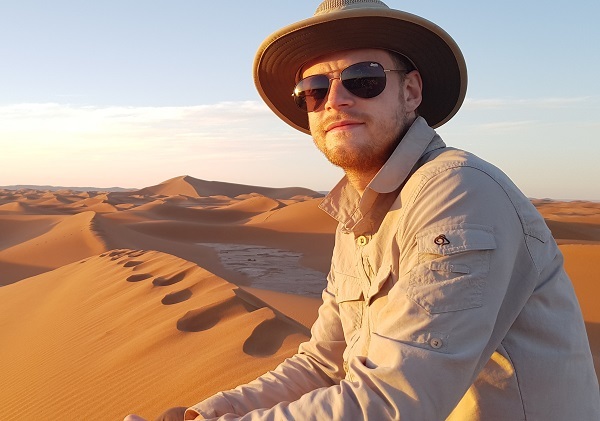 James and his uncle, an experienced trekker, now can’t wait to take part in another expedition, but want to opt for somewhere cold – the Arctic or Antarctica! James joined Bovis Homes’ South West region in November. Before that, he studied at Exeter College and worked as a chef for a year. His brother Noah was born almost two months early and weighed 3lbs at Royal Devon and Exeter Hospital.